Google Talk features on the Samsung Galaxy Tab allow you to instantly chat with friends anywhere in the world, whether they are accessing their Google Talk accounts from a computer or another mobile device. 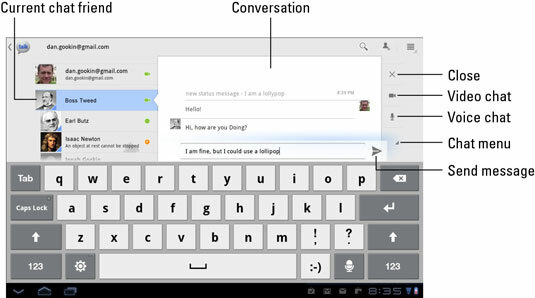 Get started with Google Talk by starting the Talk app on your Galaxy Tab. Like all the apps, it’s located on the Apps Menu, though you may be lucky and find a Talk app shortcut right on the main Home screen. When you start the Talk app the first time, you’re prompted to sign in using your Google account: Touch the Sign In button. That’s it for the not-quite-painful setup. After signing in, you see the main Talk screen. Your Google contacts who have activated Google Talk, either on their computer or on a mobile gizmo like the Galaxy Tab, appear on the left side of the screen. You can do three things with your friends while using the Talk app: Text chat, voice chat, and video chat. But before you do any of that, you need to get some friends. To sign out of Google Talk, touch the Talk icon button in the upper-left corner of the screen. On the main Talk screen, touch the Sign Out button. You can redisplay your account Status by choosing your account from the Friends list. You can touch the gray Status Message box to type in a new status for your account. Set your status icon by touching the menu just below the gray Status Message box. There are three status icons: Available, Busy, and Invisible. Yeah, it happens: You don’t have any friends. Well, at least you don’t have any friends showing up in the Friends list in Google Talk. You can easily fix that problem: Touch the Invite Friends button. 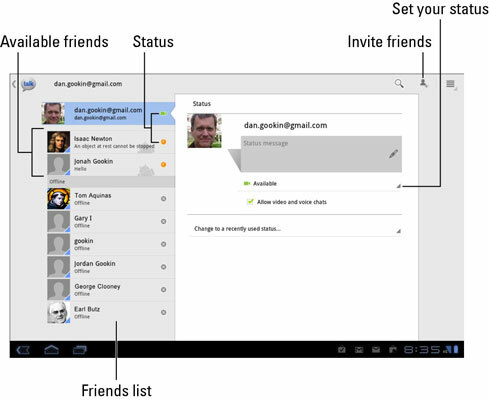 Type the friend’s e-mail address and touch the Send Invitation button to send that person an invite. You’ll receive a reply to your invitation on a mobile device running the Talk app or on a computer with the Gmail web page open. When you receive the invitation, you find it listed in the Friends list. Initiations have the heading Chat Invitation. To accept an incoming invitation, touch the Chat Invitation item in your Friends list. You see the Accept Invitation dialog box. Touch the Accept button to confirm your friendship and, eventually, chat with that person. The most basic form of communications with the Talk app is text chatting. That means typing at another person, which is probably one of the oldest forms of communications on the Internet. It’s also the most tedious. You start text chatting by touching a contact in the Friends list. Type your message. Touch the Send button to send your comment. You type, your friend types, and so on until you get tired or the Tab runs out of battery juice. When you’re done talking, touch the X (Close) button. Or you can just choose another friend from the list and chat with him. Or you can touch your own name on the list, which shows your current status. Resume any conversation by choosing that same contact from the Friends list.